Frank's overall research project is to establish methods to ensure that X-ray structures can serve as a routine and predictive tool for generating novel chemistry for targeting proteins - as opposed to them being only occasionally and retrospectively useful descriptively, as is currently generally the case. 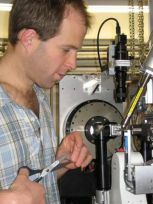 He is jointly Principal Investigator of the Protein Crystallography group in the SGC (Oxford University), as well as Principal Beamline Scientist of beamline I04-1 at Diamond Light Source synchrotron (Harwell). After his PhD in protein crystallography with Tom Blundell in Cambridge, he has focused on methodology and high throughput techniques for crystallography, first in San Diego (academically at JCSG, and industrially at Syrrx, Inc), and since 2004 at the SGC, where his group has to date helped solve over 600 crystal structures of human proteins. 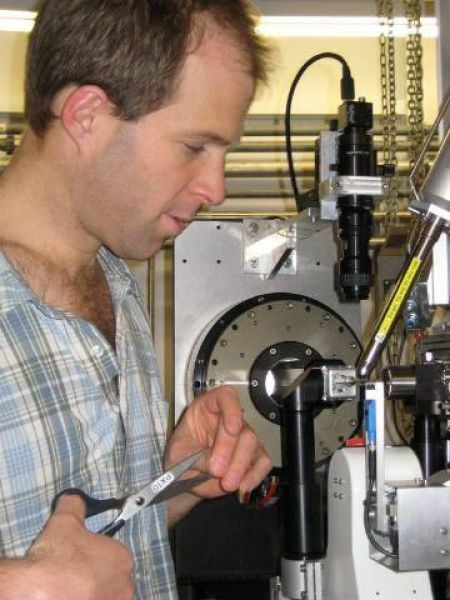 In late 2012 he set up the partnership with Diamond, in order to configure beamline I04-1 as a user facility for routine medium-throughput fragment screening by X-ray structures: this facility is now live to users from academia and industry. Accordingly, his focus and collaborations at the SGC address both ends of this facility: how to generate crystals that are suitable for such screening, and afterwards, how to proceed routinely from such a screen to compounds with good affinity. The research approach is two-pronged: developing the infrastructure (robotics, hardware, beamline) required to drive the throughput necessary for identifying the most appropriate samples at each step in the experimental process; and improving the methodology available at each step. The Ras superfamily of small GTPases are guanine nucleotide dependent switches essential for numerous cellular processes. Mutations or dysregulation of these proteins are associated with many diseases, but unsuccessful attempts to target the small GTPases directly have resulted in them being classed as 'undruggable'. The GTP dependent signaling of these proteins is controlled by their regulators; guanine nucleotide exchange factors (GEFs), GTPase activating proteins (GAPs), and in the Rho and Rab subfamilies, guanine nucleotide dissociation inhibitors (GDIs). This review covers the recent small molecule and biologics strategies to target the small GTPases through their regulators. It seeks to critically re-evaluate recent chemical biology practice, such as the presence of PAINs motifs and the cell-based readout using compounds that are weakly potent or of unknown specificity. It highlights the vast scope of potential approaches for targeting the small GTPases in the future through their regulatory proteins. Genetic defects on 6-pyruvoyl-tetrahydropterin synthase (PTPS) are the most prevalent cause of hyperphenylalaninaemia not due to phenylalanine hydrolyase deficiency (phenylketonuria). PTPS catalyses the second step of tetrahydrobiopterin (BH4) cofactor biosynthesis, and its deficiency represents the most common form of BH4 deficiency. Untreated PTPS deficiency results in depletion of the neurotransmitters dopamine, catecholamine and serotonin causing neurological symptoms. We archived reported missense variants of the PTS gene. Common in silico algorithms were used to predict the effects of such variants, and substantial proportions (up to 19%) of the variants were falsely classified as benign or uncertain. We have determined the crystal structure of the human PTPS hexamer, allowing another level of interpretation to understand the potential deleterious consequences of the variants from a structural perspective. The in silico and structure approaches appear to be complimentary and may provide new insights that are not available from each alone. Information from the protein structure suggested that the variants affecting amino acid residues required for interaction between monomeric subunits of the PTPS hexamer were those misclassified as benign by in silico algorithms. Our findings illustrate the important utility of 3D protein structure in interpretation of variants and also current limitations of in silico prediction algorithms. However, software to analyse mutation in the perspective of 3D protein structure is far less readily available than other in silico prediction tools. The XChem facility at Diamond Light Source offers fragment screening by X-ray crystallography as a general access user program. &nbsp;The main advantage of X-ray crystallography as a primary fragment screen is that it yields directly the location and pose of the fragment hits, whether within pockets of interest or merely on surface sites:&nbsp; this is the key information for structure-based design and for enabling synthesis of follow-up molecules. Extensive streamlining of the screening experiment at XChem has engendered a very active user programme that is generating large amounts of data: &nbsp;in 2017, 36 academic and industry groups generated 35,000 datasets of uniquely soaked crystals. &nbsp;It has also generated a large number of learnings concerning the main remaining bottleneck, namely obtaining a suitable crystal system that will support a successful fragment screen.&nbsp; Here we discuss the practicalities of generating screen-ready crystals that have useful electron density maps, and how to ensure they will be successfully reproduced and usable at a facility outside the home lab. Allostery is an inherent feature of proteins, but it remains challenging to reveal the mechanisms by which allosteric signals propagate. A clearer understanding of this intrinsic circuitry would afford new opportunities to modulate protein function. Here, we have identified allosteric sites in protein tyrosine phosphatase 1B (PTP1B) by combining multiple-temperature X-ray crystallography experiments and structure determination from hundreds of individual small-molecule fragment soaks. New modeling approaches reveal 'hidden' low-occupancy conformational states for protein and ligands. Our results converge on allosteric sites that are conformationally coupled to the active-site WPD loop and are hotspots for fragment binding. Targeting one of these sites with covalently tethered molecules or mutations allosterically inhibits enzyme activity. Overall, this work demonstrates how the ensemble nature of macromolecular structure, revealed here by multitemperature crystallography, can elucidate allosteric mechanisms and open new doors for long-range control of protein function. Epigenetics is a rapidly growing field in drug discovery. Of particular interest is the role of post-translational modifications to histones and the proteins that read, write, and erase such modifications. The development of inhibitors for reader domains has focused on single domains. One of the major difficulties of designing inhibitors for reader domains is that, with the notable exception of bromodomains, they tend not to possess a well-enclosed binding site amenable to small-molecule inhibition. As many of the proteins in epigenetic regulation have multiple domains, there are opportunities for designing inhibitors that bind at a domain-domain interface which provide a more suitable interaction pocket. Examination of X-ray structures of multiple domains involved in recognising and modifying post-translational histone marks using the SiteMap algorithm identified potential binding sites at domain-domain interfaces. For the tandem plant homeodomain-bromodomain of SP100C, a potential inter-domain site identified computationally was validated experimentally by the discovery of ligands by X-ray crystallographic fragment screening. Metallo-β-lactamases (MBLs) enable bacterial resistance to almost all classes of β-lactam antibiotics. We report studies on enethiol containing MBL inhibitors, which were prepared by rhodanine hydrolysis. The enethiols inhibit MBLs from different subclasses. Crystallographic analyses reveal that the enethiol sulphur displaces the di-Zn(II) ion bridging 'hydrolytic' water. In some, but not all, cases biophysical analyses provide evidence that rhodanine/enethiol inhibition involves formation of a ternary MBL enethiol rhodanine complex. The results demonstrate how low molecular weight active site Zn(II) chelating compounds can inhibit a range of clinically relevant MBLs and provide additional evidence for the potential of rhodanines to be hydrolysed to potent inhibitors of MBL protein fold and, maybe, other metallo-enzymes, perhaps contributing to the complex biological effects of rhodanines. The results imply that any medicinal chemistry studies employing rhodanines (and related scaffolds) as inhibitors should as a matter of course include testing of their hydrolysis products. Though used widely in cancer therapy, paclitaxel only elicits a response in a fraction of patients. A strong determinant of paclitaxel tumor response is the state of microtubule dynamic instability. However, whether the manipulation of this physiological process can be controlled to enhance paclitaxel response has not been tested. Here, we show a previously unrecognized role of the microtubule-associated protein CRMP2 in inducing microtubule bundling through its carboxy terminus. This activity is significantly decreased when the FER tyrosine kinase phosphorylates CRMP2 at Y479 and Y499. The crystal structures of wild-type CRMP2 and CRMP2-Y479E reveal how mimicking phosphorylation prevents tetramerization of CRMP2. Depletion of FER or reducing its catalytic activity using sub-therapeutic doses of inhibitors increases paclitaxel-induced microtubule stability and cytotoxicity in ovarian cancer cells and in vivo. This work provides a rationale for inhibiting FER-mediated CRMP2 phosphorylation to enhance paclitaxel on-target activity for cancer therapy. The CCP4 (Collaborative Computational Project, Number 4) software suite for macromolecular structure determination by X-ray crystallography groups brings together many programs and libraries that, by means of well established conventions, interoperate effectively without adhering to strict design guidelines. Because of this inherent flexibility, users are often presented with diverse, even divergent, choices for solving every type of problem. Recently, CCP4 introduced CCP4i2, a modern graphical interface designed to help structural biologists to navigate the process of structure determination, with an emphasis on pipelining and the streamlined presentation of results. In addition, CCP4i2 provides a framework for writing structure-solution scripts that can be built up incrementally to create increasingly automatic procedures. Macromolecular crystallography (MX) has been a motor for biology for over half a century and this continues apace. A series of revolutions, including the production of recombinant proteins and cryo-crystallography, have meant that MX has repeatedly reinvented itself to dramatically increase its reach. Over the last 30 years synchrotron radiation has nucleated a succession of advances, ranging from detectors to optics and automation. These advances, in turn, open up opportunities. For instance, a further order of magnitude could perhaps be gained in signal to noise for general synchrotron experiments. In addition, X-ray free-electron lasers offer to capture fragments of reciprocal space without radiation damage, and open up the subpicosecond regime of protein dynamics and activity. But electrons have recently stolen the limelight: so is X-ray crystallography in rude health, or will imaging methods, especially single-particle electron microscopy, render it obsolete for the most interesting biology, whilst electron diffraction enables structure determination from even the smallest crystals? We will lay out some information to help you decide. The XChem facility at Diamond Light Source offers fragment screening by X-ray crystallography as a general access user program. The main advantage of X-ray crystallography as a primary fragment screen is that it yields directly the location and pose of the fragment hits, whether within pockets of interest or merely on surface sites: this is the key information for structure-based design and for enabling synthesis of follow-up molecules. Extensive streamlining of the screening experiment at XChem has engendered a very active user program that is generating large amounts of data: in 2017, 36 academic and industry groups generated 35,000 datasets of uniquely soaked crystals. It has also generated a large number of learnings concerning the main remaining bottleneck, namely, obtaining a suitable crystal system that will support a successful fragment screen. Here we discuss the practicalities of generating screen-ready crystals that have useful electron density maps, and how to ensure they will be successfully reproduced and usable at a facility outside the home lab. Nicotinic acetylcholine receptors (nAChRs) belong to the family of pentameric ligand-gated ion channels and mediate fast excitatory transmission in the central and peripheral nervous systems. Among the different existing receptor subtypes, the homomeric α7 nAChR has attracted considerable attention because of its possible implication in several neurological and psychiatric disorders, including cognitive decline associated with Alzheimer's disease or schizophrenia. Allosteric modulators of ligand-gated ion channels are of particular interest as therapeutic agents, as they modulate receptor activity without affecting normal fluctuations of synaptic neurotransmitter release. Here, we used X-ray crystallography and surface plasmon resonance spectroscopy of α7-acetylcholine-binding protein (AChBP), a humanized chimera of a snail AChBP, which has 71% sequence similarity with the extracellular ligand-binding domain of the human α7 nAChR, to investigate the structural determinants of allosteric modulation. We extended previous observations that an allosteric site located in the vestibule of the receptor offers an attractive target for receptor modulation. We introduced seven additional humanizing mutations in the vestibule-located binding site of AChBP to improve its suitability as a model for studying allosteric binding. Using a fragment-based screening approach, we uncovered an allosteric binding site located near the β8-β9 loop, which critically contributes to coupling ligand binding to channel opening in human α7 nAChR. This work expands our understanding of the topology of allosteric binding sites in AChBP and, by extrapolation, in the human α7 nAChR as determined by electrophysiology measurements. Our insights pave the way for drug design strategies targeting nAChRs involved in ion channel-mediated disorders. The mitotic kinase Aurora-A and its partner protein TPX2 (Targeting Protein for Xenopus kinesin-like protein 2) are overexpressed in cancers, and it has been proposed that they work together as an oncogenic holoenzyme. TPX2 is responsible for activating Aurora-A during mitosis, ensuring proper cell division. Disruption of the interface with TPX2 is therefore a potential target for novel anticancer drugs that exploit the increased sensitivity of cancer cells to mitotic stress. Here, we investigate the interface using coprecipitation assays and isothermal titration calorimetry to quantify the energetic contribution of individual residues of TPX2. Residues Tyr8, Tyr10, Phe16, and Trp34 of TPX2 are shown to be crucial for robust complex formation, suggesting that the interaction could be abrogated through blocking any of the three pockets on Aurora-A that complement these residues. Phosphorylation of Aurora-A on Thr288 is also necessary for high-affinity binding, and here we identify arginine residues that communicate the phosphorylation of Thr288 to the TPX2 binding site. With these findings in mind, we conducted a high-throughput X-ray crystallography-based screen of 1255 fragments against Aurora-A and identified 59 hits. Over three-quarters of these hits bound to the pockets described above, both validating our identification of hotspots and demonstrating the druggability of this protein-protein interaction. Our study exemplifies the potential of high-throughput crystallography facilities such as XChem to aid drug discovery. These results will accelerate the development of chemical inhibitors of the Aurora-A/TPX2 interaction. Inhibitors of HDAC6 have attractive potential in numerous cancers. HDAC6 inhibitors to date target the catalytic domains, but targeting the unique zinc-finger ubiquitin-binding domain (Zf-UBD) of HDAC6 may be an attractive alternative strategy. We developed X-ray crystallography and biophysical assays to identify and characterize small molecules capable of binding to the Zf-UBD and competing with ubiquitin binding. Our results revealed two adjacent ligand-able pockets of HDAC6 Zf-UBD and the first functional ligands for this domain. The productive exploration of chemical space is an enduring challenge in chemical biology and medicinal chemistry. Natural products are biologically relevant, and their frameworks have facilitated chemical tool and drug discovery. A "top-down" synthetic approach is described that enabled a range of complex bridged intermediates to be converted with high step efficiency into 26 diverse sp3 -rich scaffolds. The scaffolds have local natural product-like features, but are only distantly related to specific natural product frameworks. To assess biological relevance, a set of 52 fragments was prepared, and screened by high-throughput crystallography against three targets from two protein families (ATAD2, BRD1 and JMJD2D). In each case, 3D fragment hits were identified that would serve as distinctive starting points for ligand discovery. This demonstrates that frameworks that are distantly related to natural products can facilitate discovery of new biologically relevant regions within chemical space. Crystallographic fragment screening uses low molecular weight compounds to probe the protein surface and although individual protein-fragment interactions are high quality, fragments commonly bind at low occupancy, historically making identification difficult. However, our new Pan-Dataset Density Analysis method readily identifies binders missed by conventional analysis: for fragment screening data of lysine-specific demethylase 4D (KDM4D), the hit rate increased from 0.9% to 10.6%. Previously unidentified fragments reveal multiple binding sites and demonstrate: the versatility of crystallographic fragment screening; that surprisingly large conformational changes are possible in crystals; and that low crystallographic occupancy does not by itself reflect a protein-ligand complex's significance. Although noncovalent binding by small molecules cannot be assumed a priori to be stoichiometric in the crystal lattice, occupancy refinement of ligands is often avoided by convention. Occupancies tend to be set to unity, requiring the occupancy error to be modelled by the B factors, and residual weak density around the ligand is necessarily attributed to `disorder'. Where occupancy refinement is performed, the complementary, superposed unbound state is rarely modelled. Here, it is shown that superior accuracy is achieved by modelling the ligand as partially occupied and superposed on a ligand-free `ground-state' model. Explicit incorporation of this model of the crystal, obtained from a reference data set, allows constrained occupancy refinement with minimal fear of overfitting. Better representation of the crystal also leads to more meaningful refined atomic parameters such as the B factor, allowing more insight into dynamics in the crystal. An outline of an approach for algorithmically generating ensemble models of crystals is presented, assuming that data sets representing the ground state are available. The applicability of various electron-density metrics to the validation of the resulting models is assessed, and it is concluded that ensemble models consistently score better than the corresponding single-state models. Furthermore, it appears that ignoring the superposed ground state becomes the dominant source of model error, locally, once the overall model is accurate enough; modelling the local ground state properly is then more meaningful than correcting all remaining model errors globally, especially for low-occupancy ligands. Implications for the simultaneous refinement of B factors and occupancies, and for future evaluation of the limits of the approach, in particular its behaviour at lower data resolution, are discussed. The steady expansion in the capacity of modern beamlines for high-throughput data collection, enabled by increasing X-ray brightness, capacity of robotics and detector speeds, has pushed the bottleneck upstream towards sample preparation. Even in ligand-binding studies using crystal soaking, the experiment best able to exploit beamline capacity, a primary limitation is the need for gentle and nontrivial soaking regimens such as stepwise concentration increases, even for robust and well characterized crystals. Here, the use of acoustic droplet ejection for the soaking of protein crystals with small molecules is described, and it is shown that it is both gentle on crystals and allows very high throughput, with 1000 unique soaks easily performed in under 10 min. In addition to having very low compound consumption (tens of nanolitres per sample), the positional precision of acoustic droplet ejection enables the targeted placement of the compound/solvent away from crystals and towards drop edges, allowing gradual diffusion of solvent across the drop. This ensures both an improvement in the reproducibility of X-ray diffraction and increased solvent tolerance of the crystals, thus enabling higher effective compound-soaking concentrations. The technique is detailed here with examples from the protein target JMJD2D, a histone lysine demethylase with roles in cancer and the focus of active structure-based drug-design efforts. XChemExplorer (XCE) is a data-management and workflow tool to support large-scale simultaneous analysis of protein-ligand complexes during structure-based ligand discovery (SBLD). The user interfaces of established crystallographic software packages such as CCP4 [Winn et al. (2011), Acta Cryst. D67, 235-242] or PHENIX [Adams et al. (2010), Acta Cryst. D66, 213-221] have entrenched the paradigm that a `project' is concerned with solving one structure. This does not hold for SBLD, where many almost identical structures need to be solved and analysed quickly in one batch of work. Functionality to track progress and annotate structures is essential. XCE provides an intuitive graphical user interface which guides the user from data processing, initial map calculation, ligand identification and refinement up until data dissemination. It provides multiple entry points depending on the need of each project, enables batch processing of multiple data sets and records metadata, progress and annotations in an SQLite database. XCE is freely available and works on any Linux and Mac OS X system, and the only dependency is to have the latest version of CCP4 installed. The design and usage of this tool are described here, and its usefulness is demonstrated in the context of fragment-screening campaigns at the Diamond Light Source. It is routinely used to analyse projects comprising 1000 data sets or more, and therefore scales well to even very large ligand-design projects. CDK16 (also known as PCTAIRE1 or PCTK1) is an atypical member of the cyclin-dependent kinase (CDK) family that has emerged as a key regulator of neurite outgrowth, vesicle trafficking and cancer cell proliferation. CDK16 is activated through binding to cyclin Y via a phosphorylation-dependent 14-3-3 interaction and has a unique consensus substrate phosphorylation motif compared with conventional CDKs. To elucidate the structure and inhibitor-binding properties of this atypical CDK, we screened the CDK16 kinase domain against different inhibitor libraries and determined the co-structures of identified hits. We discovered that the ATP-binding pocket of CDK16 can accommodate both type I and type II kinase inhibitors. The most potent CDK16 inhibitors revealed by cell-free and cell-based assays were the multitargeted cancer drugs dabrafenib and rebastinib. An inactive DFG-out binding conformation was confirmed by the first crystal structures of CDK16 in separate complexes with the inhibitors indirubin E804 and rebastinib, respectively. The structures revealed considerable conformational plasticity, suggesting that the isolated CDK16 kinase domain was relatively unstable in the absence of a cyclin partner. The unusual structural features and chemical scaffolds identified here hold promise for the development of more selective CDK16 inhibitors and provide opportunity to better characterise the role of CDK16 and its related CDK family members in various physiological and pathological contexts. A current metagenomics focus is to interpret and transform collected genomic data into biological information. By combining structural, functional and genomic data we have assessed a novel bacterial protein selected from a carbohydrate-related activity screen in a microbial metagenomic library from Capra hircus (domestic goat) gut. This uncharacterized protein was predicted as a bacterial cell wall-modifying enzyme (CWME) and shown to contain four domains: an N-terminal, a cysteine protease, a peptidoglycan-binding and an SH3 bacterial domain. We successfully cloned, expressed and purified this putative cysteine protease (PCP), which presented autoproteolytic activity and inhibition by protease inhibitors. We observed cell wall hydrolytic activity and ampicillin binding capacity, a characteristic of most bacterial CWME. Fluorimetric binding analysis yielded a Kb of 1.8 × 105 M-1 for ampicillin. Small-angle X-ray scattering (SAXS) showed a maximum particle dimension of 95 Å with a real-space Rg of 28.35 Å. The elongated molecular envelope corroborates the dynamic light scattering (DLS) estimated size. Furthermore, homology modeling and SAXS allowed the construction of a model that explains the stability and secondary structural changes observed by circular dichroism (CD). In short, we report a novel cell wall-modifying autoproteolytic PCP with insight into its biochemical, biophysical and structural features. Macromolecular crystallography is relied on to reveal subtle atomic difference between samples (e.g. ligand binding); yet their detection and modelling is subjective and ambiguous density is experimentally common, since molecular states of interest are generally only fractionally present. The existing approach relies on careful modelling for maximally accurate maps to make contributions of the minor fractions visible; in practice, this is time-consuming and non-objective. Instead, our PanDDA method automatically reveals clear electron density for only the changed state, even from poor models and inaccurate maps, by subtracting a proportion of the confounding ground state, accurately estimated by averaging many ground state crystals. Changed states are objectively identifiable from statistical distributions of density values; arbitrarily large searches are thus automatable. The method is completely general, implying new best practice for all changed-state studies. Finally, we demonstrate the incompleteness of current atomic models, and the need for new multi-crystal deconvolution paradigms. Heavy-atom derivatization is one of the oldest techniques for obtaining phase information for protein crystals and, although it is no longer the first choice, it remains a useful technique for obtaining phases for unknown structures and for low-resolution data sets. It is also valuable for confirming the chain trace in low-resolution electron-density maps. This overview provides a summary of the technique and is aimed at first-time users of the method. It includes guidelines on when to use it, which heavy atoms are most likely to work, how to prepare heavy-atom solutions, how to derivatize crystals and how to determine whether a crystal is in fact a derivative. Research into the chemical biology of bromodomains has been driven by the development of acetyl-lysine mimetics. The ligands are typically anchored by binding to a highly conserved asparagine residue. Atypical bromodomains, for which the asparagine is mutated, have thus far proven elusive targets, including PHIP(2) whose parent protein, PHIP, has been linked to disease progression in diabetes and cancers. The PHIP(2) binding site contains a threonine in place of asparagine, and solution screening have yielded no convincing hits. We have overcome this hurdle by combining the sensitivity of X-ray crystallography, used as the primary fragment screen, with a strategy for rapid follow-up synthesis using a chemically-poised fragment library, which allows hits to be readily modified by parallel chemistry both peripherally and in the core. Our approach yielded the first reported hit compounds of PHIP(2) with measurable IC50 values by an AlphaScreen competition assay. The follow-up libraries of four poised fragment hits improved potency into the sub-mM range while showing good ligand efficiency and detailed structural data. Although protein crystallization is generally considered more art than science and remains significantly trial-and-error, large-scale data sets hold the promise of providing general learning. Observations are presented here from retrospective analyses of the strategies actively deployed for the extensive crystallization experiments at the Oxford site of the Structural Genomics Consortium (SGC), where comprehensive annotations by SGC scientists were recorded on a customized database infrastructure. The results point to the importance of using redundancy in crystallizing conditions, specifically by varying the mixing ratios of protein sample and precipitant, as well as incubation temperatures. No meaningful difference in performance could be identified between the four most widely used sparse-matrix screens, judged by the yield of crystals leading to deposited structures; this suggests that in general any comparison of screens will be meaningless without extensive cross-testing. Where protein sample is limiting, exploring more conditions has a higher likelihood of being informative by yielding hits than does redundancy of either mixing ratio or temperature. Finally, on the logistical question of how long experiments should be stored, 98% of all crystals that led to deposited structures appeared within 30 days. Overall, these analyses serve as practical guidelines for the design of initial screening experiments for new crystallization targets. We report the discovery of N-substituted 4-(pyridin-2-yl)thiazole-2-amine derivatives and their subsequent optimization, guided by structure-based design, to give 8-(1H-pyrazol-3-yl)pyrido[3,4-d]pyrimidin-4(3H)-ones, a series of potent JmjC histone N-methyl lysine demethylase (KDM) inhibitors which bind to Fe(II) in the active site. Substitution from C4 of the pyrazole moiety allows access to the histone peptide substrate binding site; incorporation of a conformationally constrained 4-phenylpiperidine linker gives derivatives such as 54j and 54k which demonstrate equipotent activity versus the KDM4 (JMJD2) and KDM5 (JARID1) subfamily demethylases, selectivity over representative exemplars of the KDM2, KDM3, and KDM6 subfamilies, cellular permeability in the Caco-2 assay, and, for 54k, inhibition of H3K9Me3 and H3K4Me3 demethylation in a cell-based assay. © 2015 Elsevier Ltd. All rights reserved. A unique, unsolved O-mannosyl glycan on α-dystroglycan is essential for its interaction with protein ligands in the extracellular matrix. Defective O-mannosylation leads to a group of muscular dystrophies, called dystroglycanopathies. Mutations in isoprenoid synthase domain containing (ISPD) represent the second most common cause of these disorders, however, its molecular function remains uncharacterized. The human ISPD (hISPD) crystal structure showed a canonical N-terminal cytidyltransferase domain linked to a C-terminal domain that is absent in cytidyltransferase homologs. Functional studies demonstrated cytosolic localization of hISPD, and cytidyltransferase activity toward pentose phosphates, including ribulose 5-phosphate, ribose 5-phosphate, and ribitol 5-phosphate. Identity of the CDP sugars was confirmed by liquid chromatography quadrupole time-of-flight mass spectrometry and two-dimensional nuclear magnetic resonance spectroscopy. Our combined results indicate that hISPD is a cytidyltransferase, suggesting the presence of a novel human nucleotide sugar essential for functional α-dystroglycan O-mannosylation in muscle and brain. Thereby, ISPD deficiency can be added to the growing list of tertiary dystroglycanopathies. WONKA is a tool for the systematic analysis of an ensemble of protein-ligand structures. It makes the identification of conserved and unusual features within such an ensemble straightforward. WONKA uses an intuitive workflow to process structural co-ordinates. Ligand and protein features are summarised and then presented within an interactive web application. WONKA's power in consolidating and summarising large amounts of data is described through the analysis of three bromodomain datasets. Furthermore, and in contrast to many current methods, WONKA relates analysis to individual ligands, from which we find unusual and erroneous binding modes. Finally the use of WONKA as an annotation tool to share observations about structures is demonstrated. WONKA is freely available to download and install locally or can be used online at http://wonka.sgc.ox.ac.uk. Farnesyl pyrophosphate synthase (FPPS) is the major molecular target of nitrogen-containing bisphosphonates (N-BPs), used clinically as bone resorption inhibitors. We investigated the role of threonine 201 (Thr201) and tyrosine 204 (Tyr204) residues in substrate binding, catalysis and inhibition by N-BPs, employing kinetic and crystallographic studies of mutated FPPS proteins. Mutants of Thr201 illustrated the importance of the methyl group in aiding the formation of the Isopentenyl pyrophosphate (IPP) binding site, while Tyr204 mutations revealed the unknown role of this residue in both catalysis and IPP binding. The interaction between Thr201 and the side chain nitrogen of N-BP was shown to be important for tight binding inhibition by zoledronate (ZOL) and risedronate (RIS), although RIS was also still capable of interacting with the main-chain carbonyl of Lys200. The interaction of RIS with the phenyl ring of Tyr204 proved essential for the maintenance of the isomerized enzyme-inhibitor complex. Studies with conformationally restricted analogues of RIS reaffirmed the importance of Thr201 in the formation of hydrogen bonds with N-BPs. In conclusion we have identified new features of FPPS inhibition by N-BPs and revealed unknown roles of the active site residues in catalysis and substrate binding. Glycogen branching enzyme 1 (GBE1) plays an essential role in glycogen biosynthesis by generating α-1,6-glucosidic branches from α-1,4-linked glucose chains, to increase solubility of the glycogen polymer. Mutations in the GBE1 gene lead to the heterogeneous early-onset glycogen storage disorder type IV (GSDIV) or the late-onset adult polyglucosan body disease (APBD). To better understand this essential enzyme, we crystallized human GBE1 in the apo form, and in complex with a tetra- or hepta-saccharide. The GBE1 structure reveals a conserved amylase core that houses the active centre for the branching reaction and harbours almost all GSDIV and APBD mutations. A non-catalytic binding cleft, proximal to the site of the common APBD mutation p.Y329S, was found to bind the tetra- and hepta-saccharides and may represent a higher-affinity site employed to anchor the complex glycogen substrate for the branching reaction. Expression of recombinant GBE1-p.Y329S resulted in drastically reduced protein yield and solubility compared with wild type, suggesting this disease allele causes protein misfolding and may be amenable to small molecule stabilization. To explore this, we generated a structural model of GBE1-p.Y329S and designed peptides ab initio to stabilize the mutation. As proof-of-principle, we evaluated treatment of one tetra-peptide, Leu-Thr-Lys-Glu, in APBD patient cells. We demonstrate intracellular transport of this peptide, its binding and stabilization of GBE1-p.Y329S, and 2-fold increased mutant enzymatic activity compared with untreated patient cells. Together, our data provide the rationale and starting point for the screening of small molecule chaperones, which could become novel therapies for this disease. A unique, unsolved O-mannosyl glycan on α-dystroglycan is essential for its interaction with protein ligands in the extracellular matrix. Defective O-mannosylation leads to a group of muscular dystrophies, called dystroglycanopathies. Mutations in isoprenoid synthase domain containing (ISPD) represent the second most common cause of these disorders, however, its molecular function remains uncharacterized. The human ISPD (hISPD) crystal structure showed a canonical N-terminal cytidyltransferase domain linked to a C-terminal domain that is absent in cytidyltransferase homologs. Functional studies demonstrated cytosolic localization of hISPD, and cytidyltransferase activity toward pentose phosphates, including ribulose 5-phosphate, ribose 5-phosphate, and ribitol 5-phosphate. Identity of the CDP sugars was confirmed by liquid chromatography quadrupole time-of-flight mass spectrometry and two-dimensional nuclear magnetic resonance spectroscopy. Our combined results indicate that hISPD is a cytidyltransferase, suggesting the presence of a novel human nucleotide sugar essential for functional α-dystroglycan O-mannosylation in muscle and brain. Thereby, ISPD deficiency can be added to the growing list of tertiary dystroglycanopathies. © 2015, Società Italiana di Fisica and Springer-Verlag Berlin Heidelberg. X-ray crystallography is one of the most widely supported areas of science at Diamond Light Source and is the core technique on a third of the beamlines, accounting for almost a half of user publications across the whole facility. The life science community can currently call on six macromolecular crystallography beamlines (I02, I03, I04, I04-1, I23 and I24) to satisfy the increasing demand for the determination of macromolecular crystal structures from both the academic and pharmaceutical communities. In the physical sciences, there are four beamlines (I11, I15, I16 and I19) that cater for crystallographic studies ranging from the structure solution of small-molecule systems, the determination of structure at extreme conditions and the detailed analysis of the weak diffraction signal from magnetic structures. The physical science beamlines use both single-crystal and powder-diffraction techniques. All the crystallography beamlines at Diamond ensure they undergo a continuous programme of development to enable new technologies and the science they support. In this article, the current status of all the crystallography beamlines at Diamond will be discussed along with some examples of the science they have supported since they became operational. Activin receptor-like kinase 1 (ALK1, encoded by the gene ACVRL1) is a type I BMP/TGF-β receptor that mediates signalling in endothelial cells via phosphorylation of SMAD1/5/8. During angiogenesis, sprouting endothelial cells specialise into tip cells and stalk cells. ALK1 synergises with Notch in stalk cells to induce expression of the Notch targets HEY1 and HEY2 and thereby represses tip cell formation and angiogenic sprouting. The ALK1-Fc soluble protein fusion has entered clinic trials as a therapeutic strategy to sequester the high-affinity extracellular ligand BMP9. Here, we determined the crystal structure of the ALK1 intracellular kinase domain and explored the effects of a small molecule kinase inhibitor K02288 on angiogenesis. K02288 inhibited BMP9-induced phosphorylation of SMAD1/5/8 in human umbilical vein endothelial cells to reduce both the SMAD and the Notch-dependent transcriptional responses. In endothelial sprouting assays, K02288 treatment induced a hypersprouting phenotype reminiscent of Notch inhibition. Furthermore, K02288 caused dysfunctional vessel formation in a chick chorioallantoic membrane assay of angiogenesis. Such activity may be advantageous for small molecule inhibitors currently in preclinical development for specific BMP gain of function conditions, including diffuse intrinsic pontine glioma and fibrodysplasia ossificans progressiva, as well as more generally for other applications in tumour biology. Macromolecular crystallography (MX) is the most powerful technique available to structural biologists to visualize in atomic detail the macromolecular machinery of the cell. Since the emergence of structural genomics initiatives, significant advances have been made in all key steps of the structure determination process. In particular, third-generation synchrotron sources and the application of highly automated approaches to data acquisition and analysis at these facilities have been the major factors in the rate of increase of macromolecular structures determined annually. A plethora of tools are now available to users of synchrotron beamlines to enable rapid and efficient evaluation of samples, collection of the best data, and in favorable cases structure solution in near real time. Here, we provide a short overview of the emerging use of collecting X-ray diffraction data directly from the crystallization experiment. These in situ experiments are now routinely available to users at a number of synchrotron MX beamlines. A practical guide to the use of the method on the MX suite of beamlines at Diamond Light Source is given. © 2015, The Author(s). Activin receptor-like kinase 1 (ALK1, encoded by the gene ACVRL1) is a type I BMP/TGF-β receptor that mediates signalling in endothelial cells via phosphorylation of SMAD1/5/8. During angiogenesis, sprouting endothelial cells specialise into tip cells and stalk cells. ALK1 synergises with Notch in stalk cells to induce expression of the Notch targets HEY1 and HEY2 and thereby represses tip cell formation and angiogenic sprouting. The ALK1-Fc soluble protein fusion has entered clinic trials as a therapeutic strategy to sequester the high-affinity extracellular ligand BMP9. Here, we determined the crystal structure of the ALK1 intracellular kinase domain and explored the effects of a small molecule kinase inhibitor K02288 on angiogenesis. K02288 inhibited BMP9-induced phosphorylation of SMAD1/5/8 in human umbilical vein endothelial cells to reduce both the SMAD and the Notch-dependent transcriptional responses. In endothelial sprouting assays, K02288 treatment induced a hypersprouting phenotype reminiscent of Notch inhibition. Furthermore, K02288 caused dysfunctional vessel formation in a chick chorioallantoic membrane assay of angiogenesis. Such activity may be advantageous for small molecule inhibitors currently in preclinical development for specific BMP gain of function conditions, including diffuse intrinsic pontine glioma and fibrodysplasia ossificans progressiva, as well as more generally for other applications in tumour biology. The visual inspection of crystallization experiments is an important yet time-consuming and subjective step in X-ray crystallography. Previously published studies have focused on automatically classifying crystallization droplets into distinct but ultimately arbitrary experiment outcomes; here, a method is described that instead ranks droplets by their likelihood of containing crystals or microcrystals, thereby prioritizing for visual inspection those images that are most likely to contain useful information. The use of textons is introduced to describe crystallization droplets objectively, allowing them to be scored with the posterior probability of a random forest classifier trained against droplets manually annotated for the presence or absence of crystals or microcrystals. Unlike multi-class classification, this two-class system lends itself naturally to unidirectional ranking, which is most useful for assisting sequential viewing because images can be arranged simply by using these scores: this places droplets with probable crystalline behaviour early in the viewing order. Using this approach, the top ten wells included at least one human-annotated crystal or microcrystal for 94% of the plates in a data set of 196 plates imaged with a Minstrel HT system. The algorithm is robustly transferable to at least one other imaging system: when the parameters trained from Minstrel HT images are applied to a data set imaged by the Rock Imager system, human-annotated crystals ranked in the top ten wells for 90% of the plates. Because rearranging images is fundamental to the approach, a custom viewer was written to seamlessly support such ranked viewing, along with another important output of the algorithm, namely the shape of the curve of scores, which is itself a useful overview of the behaviour of the plate; additional features with known usefulness were adopted from existing viewers. Evidence is presented that such ranked viewing of images allows faster but more accurate evaluation of drops, in particular for the identification of microcrystals. 2-Oxoglutarate (2OG)-dependent oxygenases have important roles in the regulation of gene expression via demethylation of N-methylated chromatin components and in the hydroxylation of transcription factors and splicing factor proteins. Recently, 2OG-dependent oxygenases that catalyse hydroxylation of transfer RNA and ribosomal proteins have been shown to be important in translation relating to cellular growth, TH17-cell differentiation and translational accuracy. The finding that ribosomal oxygenases (ROXs) occur in organisms ranging from prokaryotes to humans raises questions as to their structural and evolutionary relationships. In Escherichia coli, YcfD catalyses arginine hydroxylation in the ribosomal protein L16; in humans, MYC-induced nuclear antigen (MINA53; also known as MINA) and nucleolar protein 66 (NO66) catalyse histidine hydroxylation in the ribosomal proteins RPL27A and RPL8, respectively. The functional assignments of ROXs open therapeutic possibilities via either ROX inhibition or targeting of differentially modified ribosomes. Despite differences in the residue and protein selectivities of prokaryotic and eukaryotic ROXs, comparison of the crystal structures of E. coli YcfD and Rhodothermus marinus YcfD with those of human MINA53 and NO66 reveals highly conserved folds and novel dimerization modes defining a new structural subfamily of 2OG-dependent oxygenases. ROX structures with and without their substrates support their functional assignments as hydroxylases but not demethylases, and reveal how the subfamily has evolved to catalyse the hydroxylation of different residue side chains of ribosomal proteins. Comparison of ROX crystal structures with those of other JmjC-domain-containing hydroxylases, including the hypoxia-inducible factor asparaginyl hydroxylase FIH and histone N(ε)-methyl lysine demethylases, identifies branch points in 2OG-dependent oxygenase evolution and distinguishes between JmjC-containing hydroxylases and demethylases catalysing modifications of translational and transcriptional machinery. The structures reveal that new protein hydroxylation activities can evolve by changing the coordination position from which the iron-bound substrate-oxidizing species reacts. This coordination flexibility has probably contributed to the evolution of the wide range of reactions catalysed by oxygenases. Bromodomains are epigenetic reader domains that have recently become popular targets. In contrast to BET bromodomains, which have proven druggable, bromodomains from other regions of the phylogenetic tree have shallower pockets. We describe successful targeting of the challenging BAZ2B bromodomain using biophysical fragment screening and structure-based optimization of high ligand-efficiency fragments into a novel series of low-micromolar inhibitors. Our results provide attractive leads for development of BAZ2B chemical probes and indicate the whole family may be tractable. Myosin V (MyoV) motors have been implicated in the intracellular transport of diverse cargoes including vesicles, organelles, RNA-protein complexes, and regulatory proteins. Here, we have solved the cargo-binding domain (CBD) structures of the three human MyoV paralogs (Va, Vb, and Vc), revealing subtle structural changes that drive functional differentiation and a novel redox mechanism controlling the CBD dimerization process, which is unique for the MyoVc subclass. Moreover, the cargo- and motor-binding sites were structurally assigned, indicating the conservation of residues involved in the recognition of adaptors for peroxisome transport and providing high resolution insights into motor domain inhibition by CBD. These results contribute to understanding the structural requirements for cargo transport, autoinhibition, and regulatory mechanisms in myosin V motors. Multi-subunit Cullin-RING E3 ligases often use repeat domain proteins as substrate-specific adaptors. Structures of these macromolecular assemblies are determined for the F-box-containing leucine-rich repeat and WD40 repeat families, but not for the suppressor of cytokine signaling (SOCS)-box-containing ankyrin repeat proteins (ASB1-18), which assemble with Elongins B and C and Cul5. We determined the crystal structures of the ternary complex of ASB9-Elongin B/C as well as the interacting N-terminal domain of Cul5 and used structural comparisons to establish a model for the complete Cul5-based E3 ligase. The structures reveal a distinct architecture of the ASB9 complex that positions the ankyrin domain coaxial to the SOCS box-Elongin B/C complex and perpendicular to other repeat protein complexes. This alternative architecture appears favorable to present the ankyrin domain substrate-binding site to the E2-ubiquitin, while also providing spacing suitable for bulky ASB9 substrates, such as the creatine kinases. The presented Cul5 structure also differs from previous models and deviates from other Cullins via a rigid-body rotation between Cullin repeats. This work highlights the adaptability of repeat domain proteins as scaffolds in substrate recognition and lays the foundation for future structure-function studies of this important E3 family. © 2013 The Authors. Modern synchrotron beamlines offer instrumentation of unprecedented quality, which in turn encourages increasingly marginal experiments, and for these, as much as ever, the ultimate success of data collection depends on the experience, but especially the care, of the experimenter. A representative set of difficult cases has been encountered at the Structural Genomics Consortium, a worldwide structural genomics initiative of which the Oxford site currently deposits three novel human structures per month. Achieving this target relies heavily on frequent visits to the Diamond Light Source, and the variety of crystal systems still demand customized data collection, diligent checks and careful planning of each experiment. Here, an overview is presented of the techniques and procedures that have been refined over the years and that are considered synchrotron best practice. Multi-subunit Cullin-RING E3 ligases often use repeat domain proteins as substrate-specific adaptors. Structures of these macromolecular assemblies are determined for the F-box-containing leucine-rich repeat and WD40 repeat families, but not for the suppressor of cytokine signaling (SOCS)-box-containing ankyrin repeat proteins (ASB1-18), which assemble with Elongins B and C and Cul5. We determined the crystal structures of the ternary complex of ASB9-Elongin B/C as well as the interacting N-terminal domain of Cul5 and used structural comparisons to establish a model for the complete Cul5-based E3 ligase. The structures reveal a distinct architecture of the ASB9 complex that positions the ankyrin domain coaxial to the SOCS box-Elongin B/C complex and perpendicular to other repeat protein complexes. This alternative architecture appears favorable to present the ankyrin domain substrate-binding site to the E2-ubiquitin, while also providing spacing suitable for bulky ASB9 substrates, such as the creatine kinases. The presented Cul5 structure also differs from previous models and deviates from other Cullins via a rigid-body rotation between Cullin repeats. This work highlights the adaptability of repeat domain proteins as scaffolds in substrate recognition and lays the foundation for future structure-function studies of this important E3 family. Mutations in the nuclear membrane zinc metalloprotease ZMPSTE24 lead to diseases of lamin processing (laminopathies), such as the premature aging disease progeria and metabolic disorders. ZMPSTE24 processes prelamin A, a component of the nuclear lamina intermediate filaments, by cleaving it at two sites. Failure of this processing results in accumulation of farnesylated, membrane-associated prelamin A. The 3.4 angstrom crystal structure of human ZMPSTE24 has a seven transmembrane α-helical barrel structure, surrounding a large, water-filled, intramembrane chamber, capped by a zinc metalloprotease domain with the catalytic site facing into the chamber. The 3.8 angstrom structure of a complex with a CSIM tetrapeptide showed that the mode of binding of the substrate resembles that of an insect metalloprotease inhibitor in thermolysin. Laminopathy-associated mutations predicted to reduce ZMPSTE24 activity map to the zinc metalloprotease peptide-binding site and to the bottom of the chamber. Mutations in the nuclear membrane zinc metalloprotease ZMPSTE24 lead to diseases of lamin processing (laminopathies), such as the premature aging disease progeria and metabolic disorders. ZMPSTE24 processes prelamin A, a component of the nuclear lamina intermediate filaments, by cleaving it at two sites. Failure of this processing results in accumulation of farnesylated, membrane-associated prelamin A. The 3.4 angstrom crystal structure of human ZMPSTE24 has a seven transmembrane α-helical barrel structure, surrounding a large, water-filled, intramembrane chamber, capped by a zinc metalloprotease domain with the catalytic site facing into the chamber. The 3.8 angstrom structure of a complex with a CSIM tetrapeptide showed that the mode of binding of the substrate resembles that of an insect metalloprotease inhibitor in thermolysin. Laminopathy-associated mutations predicted to reduce ZMPSTE24 activity map to the zinc metalloprotease peptide - binding site and to the bottom of the chamber. MAT (methionine adenosyltransferase) utilizes L-methionine and ATP to form SAM (S-adenosylmethionine), the principal methyl donor in biological methylation. Mammals encode a liver-specific isoenzyme, MAT1A, that is genetically linked with an inborn metabolic disorder of hypermethioninaemia, as well as a ubiquitously expressed isoenzyme, MAT2A, whose enzymatic activity is regulated by an associated subunit MAT2B. To understand the molecular mechanism of MAT functions and interactions, we have crystallized the ligand-bound complexes of human MAT1A, MAT2A and MAT2B. The structures of MAT1A and MAT2A in binary complexes with their product SAM allow for a comparison with the Escherichia coli and rat structures. This facilitates the understanding of the different substrate or product conformations, mediated by the neighbouring gating loop, which can be accommodated by the compact active site during catalysis. The structure of MAT2B reveals an SDR (short-chain dehydrogenase/reductase) core with specificity for the NADP/H cofactor, and harbours the SDR catalytic triad (YxxxKS). Extended from the MAT2B core is a second domain with homology with an SDR sub-family that binds nucleotide-sugar substrates, although the equivalent region in MAT2B presents a more open and extended surface which may endow a different ligand/protein-binding capability. Together, the results of the present study provide a framework to assign structural features to the functional and catalytic properties of the human MAT proteins, and facilitate future studies to probe new catalytic and binding functions. Tumor suppressors p53, p63 and p73 comprise a family of stress-responsive transcription factors with distinct functions in development and tumor suppression. Most human cancers lose p53 function, yet all three proteins are capable of inducing apoptosis or cellular senescence. Mechanisms are therefore under investigation to activate p73-dependent apoptosis in p53-deficient cancer cells. Significantly, the DNA-binding domain (DBD) of p73 escapes viral oncoproteins and displays an enhanced thermal stability. To further understand the variant features of p73, we solved the high-resolution crystal structure of the p73 DBD as well as its complex with the ankyrin repeat and SH3 domains of the pro-apoptotic factor ASPP2. The p73 structure exhibits the same conserved architecture as p53 but displays a divergent L2 loop, a known site of protein-protein interaction. The loop in p73 is changed by a two-residue insertion that also induces repacking around the site of the p53 mutational hotspot R175. Importantly, the binding of ASPP2 is preserved by conformational changes in both the ankyrin repeat and SH3 domains. These results further highlight the structural variation that impacts p53 family interactions within the p53 interactome. © 2012 Elsevier Ltd.
Background: Mutations in the ALK2 kinase cause extraskeletal bone formation. Results: We solved the structure of ALK2 in complex with the inhibitor FKBP12. Conclusion: Disease mutations break critical interactions that stabilize the inactive ALK2-FKBP12 complex leading to kinase activation. Significance: We offer an explanation for the effects of mutation and a structural template for the design of small molecule inhibitors. © 2012 by The American Society for Biochemistry and Molecular Biology, Inc. Bone morphogenetic protein (BMP) receptor kinases are tightly regulated to control development and tissue homeostasis. Mutant receptor kinase domains escape regulation leading to severely degenerative diseases and represent an important therapeutic target. Fibrodysplasia ossificans progressiva (FOP) is a rare but devastating disorder of extraskeletal bone formation. FOP-associated mutations in the BMP receptor ALK2 reduce binding of the inhibitor FKBP12 and promote leaky signaling in the absence of ligand. To establish structural mechanisms of receptor regulation and to address the effects of FOP mutation, we determined the crystal structure of the cytoplasmic domain of ALK2 in complex with the inhibitors FKBP12 and dorsomorphin. FOP mutations break critical interactions that stabilize the inactive state of the kinase, thereby facilitating structural rearrangements that diminish FKBP12 binding and promote the correct positioning of the glycine-serine-rich loop and αC helix for kinase activation. The balance of these effects accounts for the comparable activity of R206H and L196P. Kinase activation in the clinically benign mutant L196P is far weaker than R206H but yields equivalent signals due to the stronger interaction of FKBP12 with R206H. The presented ALK2 structure offers a valuable template for the further design of specific inhibitors of BMP signaling. Tumor suppressors p53, p63 and p73 comprise a family of stress-responsive transcription factors with distinct functions in development and tumor suppression. Most human cancers lose p53 function, yet all three proteins are capable of inducing apoptosis or cellular senescence. Mechanisms are therefore under investigation to activate p73-dependent apoptosis in p53-deficient cancer cells. Significantly, the DNA-binding domain (DBD) of p73 escapes viral oncoproteins and displays an enhanced thermal stability. To further understand the variant features of p73, we solved the high-resolution crystal structure of the p73 DBD as well as its complex with the ankyrin repeat and SH3 domains of the pro-apoptotic factor ASPP2. The p73 structure exhibits the same conserved architecture as p53 but displays a divergent L2 loop, a known site of protein-protein interaction. The loop in p73 is changed by a two-residue insertion that also induces repacking around the site of the p53 mutational hotspot R175. Importantly, the binding of ASPP2 is preserved by conformational changes in both the ankyrin repeat and SH3 domains. These results further highlight the structural variation that impacts p53 family interactions within the p53 interactome. The JmjC oxygenases catalyze the N-demethylation of N(ε)-methyl lysine residues in histones and are current therapeutic targets. A set of human 2-oxoglutarate analogues were screened using a unified assay platform for JmjC demethylases and related oxygenases. Results led to the finding that daminozide (N-(dimethylamino)succinamic acid, 160 Da), a plant growth regulator, selectively inhibits the KDM2/7 JmjC subfamily. Kinetic and crystallographic studies reveal that daminozide chelates the active site metal via its hydrazide carbonyl and dimethylamino groups. BACKGROUND: Aspartyl aminopeptidase (DNPEP), with specificity towards an acidic amino acid at the N-terminus, is the only mammalian member among the poorly understood M18 peptidases. DNPEP has implicated roles in protein and peptide metabolism, as well as the renin-angiotensin system in blood pressure regulation. Despite previous enzyme and substrate characterization, structural details of DNPEP regarding ligand recognition and catalytic mechanism remain to be delineated. RESULTS: The crystal structure of human DNPEP complexed with zinc and a substrate analogue aspartate-β-hydroxamate reveals a dodecameric machinery built by domain-swapped dimers, in agreement with electron microscopy data. A structural comparison with bacterial homologues identifies unifying catalytic features among the poorly understood M18 enzymes. The bound ligands in the active site also reveal the coordination mode of the binuclear zinc centre and a substrate specificity pocket for acidic amino acids. CONCLUSIONS: The DNPEP structure provides a molecular framework to understand its catalysis that is mediated by active site loop swapping, a mechanism likely adopted in other M18 and M42 metallopeptidases that form dodecameric complexes as a self-compartmentalization strategy. Small differences in the substrate binding pocket such as shape and positive charges, the latter conferred by a basic lysine residue, further provide the key to distinguishing substrate preference. Together, the structural knowledge will aid in the development of enzyme-/family-specific aminopeptidase inhibitors. TM0077 from Thermotoga maritima is a member of the carbohydrate esterase family 7 and is active on a variety of acetylated compounds, including cephalosporin C. TM0077 esterase activity is confined to short-chain acyl esters (C2-C3), and is optimal around 100°C and pH 7.5. The positional specificity of TM0077 was investigated using 4-nitrophenyl-β-D-xylopyranoside monoacetates as substrates in a β-xylosidase-coupled assay. TM0077 hydrolyzes acetate at positions 2, 3, and 4 with equal efficiency. No activity was detected on xylan or acetylated xylan, which implies that TM0077 is an acetyl esterase and not an acetyl xylan esterase as currently annotated. Selenomethionine-substituted and native structures of TM0077 were determined at 2.1 and 2.5 Å resolution, respectively, revealing a classic α/β-hydrolase fold. TM0077 assembles into a doughnut-shaped hexamer with small tunnels on either side leading to an inner cavity, which contains the six catalytic centers. Structures of TM0077 with covalently bound phenylmethylsulfonyl fluoride and paraoxon were determined to 2.4 and 2.1 Å, respectively, and confirmed that both inhibitors bind covalently to the catalytic serine (Ser188). Upon binding of inhibitor, the catalytic serine adopts an altered conformation, as observed in other esterase and lipases, and supports a previously proposed catalytic mechanism in which Ser hydroxyl rotation prevents reversal of the reaction and allows access of a water molecule for completion of the reaction. © 2012 Wiley Periodicals, Inc. Defects in the MMACHC gene represent the most common disorder of cobalamin (Cbl) metabolism, affecting synthesis of the enzyme cofactors adenosyl-Cbl and methyl-Cbl. The encoded MMACHC protein binds intracellular Cbl derivatives with different upper axial ligands and exhibits flavin mononucleotide (FMN)-dependent decyanase activity toward cyano-Cbl as well as glutathione (GSH)-dependent dealkylase activity toward alkyl-Cbls. We determined the structure of human MMACHC·adenosyl-Cbl complex, revealing a tailor-made nitroreductase scaffold which binds adenosyl-Cbl in a "base-off, five-coordinate" configuration for catalysis. We further identified an arginine-rich pocket close to the Cbl binding site responsible for GSH binding and dealkylation activity. Mutation of these highly conserved arginines, including a replication of the prevalent MMACHC missense mutation, Arg161Gln, disrupts GSH binding and dealkylation. We further showed that two Cbl-binding monomers dimerize to mediate the reciprocal exchange of a conserved "PNRRP" loop from both subunits, serving as a protein cap for the upper axial ligand in trans and required for proper dealkylation activity. Our dimeric structure is supported by solution studies, where dimerization is triggered upon binding its substrate adenosyl-Cbl or cofactor FMN. Together our data provide a structural framework to understanding catalytic function and disease mechanism for this multifunctional enzyme. When crystallization screening is conducted many outcomes are observed but typically the only trial recorded in the literature is the condition that yielded the crystal(s) used for subsequent diffraction studies. The initial hit that was optimized and the results of all the other trials are lost. These missing results contain information that would be useful for an improved general understanding of crystallization. This paper provides a report of a crystallization data exchange (XDX) workshop organized by several international large-scale crystallization screening laboratories to discuss how this information may be captured and utilized. A group that administers a significant fraction of the world's crystallization screening results was convened, together with chemical and structural data informaticians and computational scientists who specialize in creating and analysing large disparate data sets. The development of a crystallization ontology for the crystallization community was proposed. This paper (by the attendees of the workshop) provides the thoughts and rationale leading to this conclusion. This is brought to the attention of the wider audience of crystallographers so that they are aware of these early efforts and can contribute to the process going forward. Glycogenin initiates the synthesis of a maltosaccharide chain covalently attached to itself on Tyr195 via a stepwise glucosylation reaction, priming glycogen synthesis. We have captured crystallographic snapshots of human glycogenin during its reaction cycle, revealing a dynamic conformational switch between ground and active states mediated by the sugar donor UDP-glucose. This switch includes the ordering of a polypeptide stretch containing Tyr195, and major movement of an approximately 30-residue "lid" segment covering the active site. The rearranged lid guides the nascent maltosaccharide chain into the active site in either an intra- or intersubunit mode dependent upon chain length and steric factors and positions the donor and acceptor sugar groups for catalysis. The Thr83Met mutation, which causes glycogen storage disease XV, is conformationally locked in the ground state and catalytically inactive. Our data highlight the conformational plasticity of glycogenin and coexistence of two modes of glucosylation as integral to its catalytic mechanism. BACKGROUND: Hundreds of millions of people are infected with cryptosporidiosis annually, with immunocompromised individuals suffering debilitating symptoms and children in socioeconomically challenged regions at risk of repeated infections. There is currently no effective drug available. In order to facilitate the pursuit of anti-cryptosporidiosis targets and compounds, our study spans the classification of the Cryptosporidium parvum kinome and the structural and biochemical characterization of representatives from the CDPK family and a MAP kinase. RESULTS: The C. parvum kinome comprises over 70 members, some of which may be promising drug targets. These C. parvum protein kinases include members in the AGC, Atypical, CaMK, CK1, CMGC, and TKL groups; however, almost 35% could only be classified as OPK (other protein kinases). In addition, about 25% of the kinases identified did not have any known orthologues outside of Cryptosporidium spp. Comparison of specific kinases with their Plasmodium falciparum and Toxoplasma gondii orthologues revealed some distinct characteristics within the C. parvum kinome, including potential targets and opportunities for drug design. Structural and biochemical analysis of 4 representatives of the CaMK group and a MAP kinase confirms features that may be exploited in inhibitor design. Indeed, screening CpCDPK1 against a library of kinase inhibitors yielded a set of the pyrazolopyrimidine derivatives (PP1-derivatives) with IC₅₀ values of < 10 nM. The binding of a PP1-derivative is further described by an inhibitor-bound crystal structure of CpCDPK1. In addition, structural analysis of CpCDPK4 identified an unprecedented Zn-finger within the CDPK kinase domain that may have implications for its regulation. CONCLUSIONS: Identification and comparison of the C. parvum protein kinases against other parasitic kinases shows how orthologue- and family-based research can be used to facilitate characterization of promising drug targets and the search for new drugs. The radiation damage behaviour in 43 datasets of 34 different proteins collected over a year was examined, in order to gauge the reliability of decay metrics in practical situations, and to assess how these datasets, optimized only empirically for decay, would have benefited from the precise and automatic prediction of decay now possible with the programs RADDOSE [Murray, Garman & Ravelli (2004). J. Appl. Cryst. 37, 513-522] and BEST [Bourenkov & Popov (2010). Acta Cryst. D66, 409-419]. The results indicate that in routine practice the diffraction experiment is not yet characterized well enough to support such precise predictions, as these depend fundamentally on three interrelated variables which cannot yet be determined robustly and practically: the flux density distribution of the beam; the exact crystal volume; the sensitivity of the crystal to dose. The former two are not satisfactorily approximated from typical beamline information such as nominal beam size and transmission, or two-dimensional images of the beam and crystal; the discrepancies are particularly marked when using microfocus beams (<20 µm). Empirically monitoring decay with the dataset scaling B factor (Bourenkov & Popov, 2010) appears more robust but is complicated by anisotropic and/or low-resolution diffraction. These observations serve to delineate the challenges, scientific and logistic, that remain to be addressed if tools for managing radiation damage in practical data collection are to be conveniently robust enough to be useful in real time. ABL2 (also known as ARG (ABL related gene)) is closely related to the well-studied Abelson kinase cABL. ABL2 is involved in human neoplastic diseases and is deregulated in solid tumors. Oncogenic gene translocations occur in acute leukemia. So far no structural information for ABL2 has been reported. To elucidate structural determinants for inhibitor interaction, we determined the cocrystal structure of ABL2 with the oncology drug imatinib. Interestingly, imatinib not only interacted with the ATP binding site of the inactive kinase but was also bound to the regulatory myristate binding site. This structure may therefore serve as a tool for the development of allosteric ABL inhibitors. In addition, we determined the structures of ABL2 in complex with VX-680 and with an ATP-mimetic type I inhibitor, which revealed an interesting position of the DFG motif intermediate between active and inactive conformations, that may also serve as a template for future inhibitor design. The final step in carnitine biosynthesis is catalyzed by γ-butyrobetaine (γBB) hydroxylase (BBOX), an iron/2-oxoglutarate (2OG) dependent oxygenase. BBOX is inhibited by trimethylhydrazine-propionate (THP), a clinically used compound. We report structural and mechanistic studies on BBOX and its reaction with THP. Crystallographic and sequence analyses reveal that BBOX and trimethyllysine hydroxylase form a subfamily of 2OG oxygenases that dimerize using an N-terminal domain. The crystal structure reveals the active site is enclosed and how THP competes with γBB. THP is a substrate giving formaldehyde (supporting structural links with histone demethylases), dimethylamine, malonic acid semi-aldehyde, and an unexpected product with an additional carbon-carbon bond resulting from N-demethylation coupled to oxidative rearrangement, likely via an unusual radical mechanism. The results provide a basis for development of improved BBOX inhibitors and may inspire the discovery of additional rearrangement reactions. Human GLRX5 (glutaredoxin 5) is an evolutionarily conserved thiol-disulfide oxidoreductase that has a direct role in the maintenance of normal cytosolic and mitochondrial iron homoeostasis, and its expression affects haem biosynthesis and erythropoiesis. We have crystallized the human GLRX5 bound to two [2Fe-2S] clusters and four GSH molecules. The crystal structure revealed a tetrameric organization with the [2Fe-2S] clusters buried in the interior and shielded from the solvent by the conserved β1-α2 loop, Phe⁶⁹ and the GSH molecules. Each [2Fe-2S] cluster is ligated by the N-terminal activesite cysteine (Cys⁶⁷) thiols contributed by two protomers and two cysteine thiols from two GSH. The two subunits co-ordinating the cluster are in a more extended conformation compared with iron-sulfur-bound human GLRX2, and the intersubunit interactions are more extensive and involve conserved residues among monothiol GLRXs. Gel-filtration chromatography and analytical ultracentrifugation support a tetrameric organization of holo-GLRX5, whereas the apoprotein is monomeric. MS analyses revealed glutathionylation of the cysteine residues in the absence of the [2Fe-2S] cluster, which would protect them from further oxidation and possibly facilitate cluster transfer/acceptance. Apo-GLRX5 reduced glutathione mixed disulfides with a rate 100 times lower than did GLRX2 and was active as a glutathione-dependent electron donor for mammalian ribonucleotide reductase. UNLABELLED: Long-term potentiation (LTP), a long-lasting enhancement in communication between neurons, is considered to be the major cellular mechanism underlying learning and memory. LTP triggers high-frequency calcium pulses that result in the activation of Calcium/Calmodulin (CaM)-dependent kinase II (CaMKII). CaMKII acts as a molecular switch because it remains active for a long time after the return to basal calcium levels, which is a unique property required for CaMKII function. Here we describe the crystal structure of the human CaMKIIdelta/Ca2+/CaM complex, structures of all four human CaMKII catalytic domains in their autoinhibited states, as well as structures of human CaMKII oligomerization domains in their tetradecameric and physiological dodecameric states. All four autoinhibited human CaMKIIs were monomeric in the determined crystal structures but associated weakly in solution. In the CaMKIIdelta/Ca2+/CaM complex, the inhibitory region adopted an extended conformation and interacted with an adjacent catalytic domain positioning T287 into the active site of the interacting protomer. Comparisons with autoinhibited CaMKII structures showed that binding of calmodulin leads to the rearrangement of residues in the active site to a conformation suitable for ATP binding and to the closure of the binding groove for the autoinhibitory helix by helix alphaD. The structural data, together with biophysical interaction studies, reveals the mechanism of CaMKII activation by calmodulin and explains many of the unique regulatory properties of these two essential signaling molecules. ENHANCED VERSION: This article can also be viewed as an enhanced version in which the text of the article is integrated with interactive 3-D representations and animated transitions. Please note that a web plugin is required to access this enhanced functionality. Instructions for the installation and use of the Web plugin are available in Text S1. Radiation damage affects MAD experiments in two ways: (i) increased absorption by the crystal at the wavelengths of interest for the experiment results in faster crystal deterioration; (ii) lack of isomorphism induced by radiation damage causes problems when scaling and merging data at different wavelengths and can prevent accurate measurement of anomalous and dispersive differences. In an attempt to overcome these problems in the case of radiation-sensitive crystals of vinculin, two-wavelength MAD data were collected at the Se absorption-edge inflection and at high-energy remote wavelengths. Although this strategy resulted in a lower total absorbed dose compared with a standard three-wavelength experiment using the peak wavelength, an increase in the unit-cell volume and other effects attributable to radiation damage were still observed. In an effort to extract the maximum information available from the data, different data-processing and scaling procedures were compared. Scaling approaches involving local scaling of unmerged reflections were consistently successful and most ordered Se sites could be located. Subsequent use of these sites for phasing resulted in an interpretable electron density map. This case demonstrates the feasibility of two-wavelength MAD in the presence of moderate radiation damage using conventional data collection strategies and widely available standard software. We report the crystal structure of E. coli ketopantoate hydroxymethyltransferase (KPHMT) at 1.9 A resolution, in complex with its product, ketopantoate. KPHMT catalyzes the first step in the biosynthesis of pantothenate (vitamin B(5)), the precursor of coenzyme A and the acyl carrier protein cofactor. The structure of the decameric enzyme was solved by multiwavelength anomalous dispersion to locate 160 selenomethionine sites and phase 560 kDa of protein, making it the largest structure solved by this approach. KPHMT adopts the (betaalpha)(8) barrel fold and is a member of the phosphoenolpyruvate/pyruvate superfamily. The active site contains a ketopantoate bidentately coordinated to Mg(2+). Similar binding is likely for the substrate, alpha-ketoisovalerate, orienting the C3 for deprotonation. Shikimate dehydrogenase catalyzes the NADPH-dependent reversible reduction of 3-dehydroshikimate to shikimate. We report the first X-ray structure of shikimate dehydrogenase from Haemophilus influenzae to 2.4-A resolution and its complex with NADPH to 1.95-A resolution. The molecule contains two domains, a catalytic domain with a novel open twisted alpha/beta motif and an NADPH binding domain with a typical Rossmann fold. The enzyme contains a unique glycine-rich P-loop with a conserved sequence motif, GAGGXX, that results in NADPH adopting a nonstandard binding mode with the nicotinamide and ribose moieties disordered in the binary complex. A deep pocket with a narrow entrance between the two domains, containing strictly conserved residues primarily contributed by the catalytic domain, is identified as a potential 3-dehydroshikimate binding pocket. The flexibility of the nicotinamide mononucleotide portion of NADPH may be necessary for the substrate 3-dehydroshikimate to enter the pocket and for the release of the product shikimate. Ketopantoate reductase (KPR, EC 1.1.1.169) catalyzes the NADPH-dependent reduction of ketopantoate to pantoate on the pantothenate (vitamin B(5)) biosynthetic pathway. The Escherichia coli panE gene encoding KPR was cloned and expressed at high levels as the native and selenomethionine-substituted (SeMet) proteins. Both native and SeMet recombinant proteins were purified by three chromatographic steps, to yield pure proteins. The wild-type enzyme was found to have a K(M)(NADPH) of 20 microM, a K(M)(ketopantoate) of 60 microM, and a k(cat) of 40 s(-1). Regular prismatic KPR crystals were prepared using the hanging drop technique. They belonged to the tetragonal space group P4(2)2(1)2, with cell parameters: a = b = 103.7 A and c = 55.7 A, accommodating one enzyme molecule per asymmetric unit. The structure of KPR was determined by the multiwavelength anomalous dispersion method using the SeMet protein, for which data were collected to 2.3 A resolution. The native data were collected to 1.7 A resolution and used to refine the final structure. The secondary structure comprises 12 alpha-helices, three 3(10)-helices, and 11 beta-strands. The enzyme is monomeric and has two domains separated by a cleft. The N-terminal domain has an alphabeta-fold of the Rossmann type. The C-terminal domain (residues 170-291) is composed of eight alpha-helices. KPR is shown to be a member of the 6-phosphogluconate dehydrogenase C-terminal domain-like superfamily. A model for the ternary enzyme-NADPH-ketopantoate ternary complex provides a rationale for kinetic data reported for specific site-directed mutants. The decarboxylation of L-aspartate by E. coli L-aspartate-alpha-decarboxylase (ADC) is shown to occur with retention of configuration; analysis of the protein structure identifies Tyr58 as the proton donor in the decarboxylation mechanism. BACKGROUND: Pantothenate synthetase (EC 6.3.2.1) is the last enzyme of the pathway of pantothenate (vitamin B(5)) synthesis. It catalyzes the condensation of pantoate with beta-alanine in an ATP-dependent reaction. RESULTS: We describe the overexpression, purification, and crystal structure of recombinant pantothenate synthetase from E. coli. The structure was solved by a selenomethionine multiwavelength anomalous dispersion experiment and refined against native data to a final R(cryst) of 22.6% (R(free) = 24.9%) at 1.7 A resolution. The enzyme is dimeric, with two well-defined domains per protomer: the N-terminal domain, a Rossmann fold, contains the active site cavity, with the C-terminal domain forming a hinged lid. CONCLUSIONS: The N-terminal domain is structurally very similar to class I aminoacyl-tRNA synthetases and is thus a member of the cytidylyltransferase superfamily. This relationship has been used to suggest the location of the ATP and pantoate binding sites and the nature of hinge bending that leads to the ternary enzyme-pantoate-ATP complex. Fibroblast growth factors (FGFs) are a large family of structurally related proteins with a wide range of physiological and pathological activities. Signal transduction requires association of FGF with its receptor tyrosine kinase (FGFR) and heparan sulphate proteoglycan in a specific complex on the cell surface. Direct involvement of the heparan sulphate glycosaminoglycan polysaccharide in the molecular association between FGF and its receptor is essential for biological activity. Although crystal structures of binary complexes of FGF-heparin and FGF-FGFR have been described, the molecular architecture of the FGF signalling complex has not been elucidated. Here we report the crystal structure of the FGFR2 ectodomain in a dimeric form that is induced by simultaneous binding to FGF1 and a heparin decasaccharide. The complex is assembled around a central heparin molecule linking two FGF1 ligands into a dimer that bridges between two receptor chains. The asymmetric heparin binding involves contacts with both FGF1 molecules but only one receptor chain. The structure of the FGF1-FGFR2-heparin ternary complex provides a structural basis for the essential role of heparan sulphate in FGF signalling. The structure of L-aspartate-alpha-decarboxylase from E. coli has been determined at 2.2 A resolution. The enzyme is a tetramer with pseudofour-fold rotational symmetry. The subunits are six-stranded beta-barrels capped by small alpha-helices at each end. The active sites are located between adjacent subunits. The electron density provides evidence for catalytic pyruvoyl groups at three active sites and an ester at the fourth. The ester is an intermediate in the autocatalytic self-processing leading to formation of the pyruvoyl group. This unprecedented structure provides novel insights into the general phenomenon of protein processing.